Here follows the storyline of the events, as it was told by Alexandru Odobescu. Lemnar and Avram were mining for stones to be used at erecting the bishopric seminary in Buzău and found the hoard between two limestone blocks, at small depth. The hoard was hidden in the village for more than a year. In 1838 the finders were working in stone extraction for building a bridge over the river of Cîlnău. The works were led by Albanian craftsman (or maybe Aromanian, as he was from Bitola) Anastase Tarba Verussi, and the peasants told him about the objects they had found. Subsequently Verussi got an object from the hoard and took it to Bucharest to verify it. After his return he negotiated with the peasants and bought the entire hoard (save two artefacts). He payed 4000 lei, adding a few bodices and kerchiefs to this for the wives of the sellers. In 1838 the leu had 40 paras, being equal to the Turkish piastre. The sum of 4000 lei (old) is evaluated by Odobescu to approximately 1500 francs or new lei. For sure, such a transaction was deeply illegal. The Codex of Caragea, valid in 1838, clearly stipulated that all hoards found buried belonged to the state. As soon as he took into his possession the hoard, Verussi flattened with an axe some of the artefacts, cleft others into pieces. On the occasion of this "ruthless mistreatment" a large share of the gems adorning the objects broke loose out of the sockets. Considered plain pieces of glass, they were swept into a ditch, as trash. Some of the gems, the largest ones, were taken a few weeks later by Verussi, and the small ones were taken by the village children. Rumors aboat the hoard started quickly to spread. George Frunză-Verde, the land lessee of the demesne on which the peasants lived, with the "interested participation" of postelnic Dumitrache Ghizdeanu, blackmailed Verussi, and got as bribe a big golden ring and 200 yirmiliks. The authorities found out soon about the hoard. George Frunză-Verde, unhappy with his share, informed the Bishopric of Buzău that on its lands a treasure had been found. Immediately, a commission came from Bucharest to Pietroasa for inquiries, which were led with a strong hand. All those implicated in the discovery, hiding and trafficking of the hoard were arrested, interrogated and submitted to "bad treatments". Probably Odobescu used this euphemism in order to avoid saying directly that the arrested were harshly beaten, or even tortured. Verussi declared he had sold all the artefacts to a peddler who headed for Moldavia. But the police managed to intercept a letter written in Albanian, out of which it resulted that the hoard would have still been hidden. Mihalache Ghica, brother of prince Alexandru Ghica and vornic of the Department of Internal Affairs, came personally to Pietroasa. Having the letter shown to Verussi, the later led the former to a share of the hoard items; nine artefacts were so recovered, hidden inside two holes on the bank of Cîlnău River. The perquisitions performed afterwards revealed only small fragments. The most important completion was the statuette in the middle of the patera. The two finders of the hoard died while in arrest, before the trial was over. Two peasants were condemned to one year in prison each and beating: each was to receive 30 lashes with the rod. Surprisingly, Verussi was acquitted, and became later on a big entrepreneur of public works. The hoard is supposed to have comprised 22 pieces, some adorned with gems. When the authorities heard about it and the hoard was confiscated, 10 pieces had already disappeared, having probably been melted. The hoard comprises a great tray, that was split in four by Verroussi (the tray has 54.5 centimeters in diameter and weighs over 7 kilograms), a patera (a shallow circular bowl used for libations - with 25 centimeters in diameter) with pagan gods representations, an octagonal vessel, a decagonal vessel, an oenochoe vessel, an urn, a ring and some fibulae. The remaining pieces of the hoard weigh over 18 kilos. The patera and the oenochoe vessel are crafted in classical Hellenistic style. The other pieces are characterized by the insertion of the gems into the body of the objects, a setting technique characteristic to the peoples of the Pontic steppe (information from book "History of Plastic Arts in Romania, in Romanian, Bucharest, 1968, edition responsible: George Oprescu, member of the Romanian Academy). The hoard was owned by a Germanic people, being attributed to the Visigoths or maybe to the Ostrogoths. It was stashed in the 4th or even 5th century AD. In the book "History of the Romanians" (Istoria românilor) by Constantin C. Giurescu and Dinu C. Giurescu, the hypothesis is mentioned that the hoard belonged to Athanaric, chieftain of the Visigoths. In 376 king Athanaric retreated to a place named Caucaland - possibly the actual zone of Buzău - before the Hunnic pressure (deeds recorded by the Roman historian Ammianus Marcellinus in the book Rerum gestarum libri). In the book "History of the Romanians" it is also described a runic inscription on the ring: "Guthâni Ocwi Hailag", translated as "to Odin blessed country" or maybe "of the Goths sacred propriety I am". The hoard is known by its popular name, "The hen with golden chicks" due to a physical resemblance of the fibulae with some fowl (at least the great fibula has the top shaped as an eagle). Fibula was used in the antiquity as a brooch or safety-pin for fastening garments, as a substitute for buttons. An usual fibula had a bow-shaped head and a pin. Some fibulae also had pendants. Oenochoe of oinochoe was a deep wine jug, with a graceful aspect, having a trefoil-shaped mouth. The name of this jug comes from Greek, originating in the word oinos meaning wine. On November 20th 1875 the recidivist thief Pantazescu was hidden in the Library of the Senate, which was just over the room of the National Museum inside which the "Hen" was exhibited (both institutions being located inside the Palace of the University, building also represented on a Romanian anniversary coin: 500 lei 2004). The thief drilled a hole in the floor with a borer, introduced an umbrella through the hole and enlarged the hole enough for him to pass through. Because that night there was a blizzard, the sentinel who guarded the museum did not hear anything of sounds of debris falling inside the open umbrella. The thief descended in the museum with a rope, taking all the Pietroasa hoard items. The next day Pantazescu left the building with the gold pieces tied in his pant legs. Being hindered by one of the artefacts, he threw it into the snow. One of the professors found it later and sounded the alarm. The thief was caught after few days, being convicted to 6 years in prison for robbery. He was shot to death while making an escape attempt. Unfortunately Pantazescu flattened again some of the items, so that the hoard was again in need of restoration. For this a specialist came from Berlin to Bucharest, Paul Telge. Presently the hoard endures in the state that Telge left it over more than a century ago. In September 1916 the Romanian government was moved from Bucharest to Iaşi, after the collapse of the front line. The National Bank of Romania was also moved to Iaşi, with all its deposits. As the possibility for the Central Powers to occupy Moldavia became realer and realer, in December the part of the Romanian national treasury that guaranteed the banknotes circulation - 314 millions gold lei - was evacuated to Moscow. In July 1917 the Romanian government was constrained to evacuate to Russia valuables worth 1.600 million lei, the hoard of Pietroasa being among them. After WWI the Soviets refused to return the treasury, on the account that only the working class of Romania was entitled to have it back, as rightful owner of Romanian wealth, whereas the Romanian state was governed at the time by a capitalist regime exploiting the working class and as such unrighteously representing the Romanian people, hence rendering itself unworthy. A very small part of the Romanian treasury has returned to Bucharest. The 12 pieces of the Pietroasa hoard came back to Romania in 1956. The gold coins set pictures above are present on Romanian coins through the kind permission of Mr. Radu Lissner. 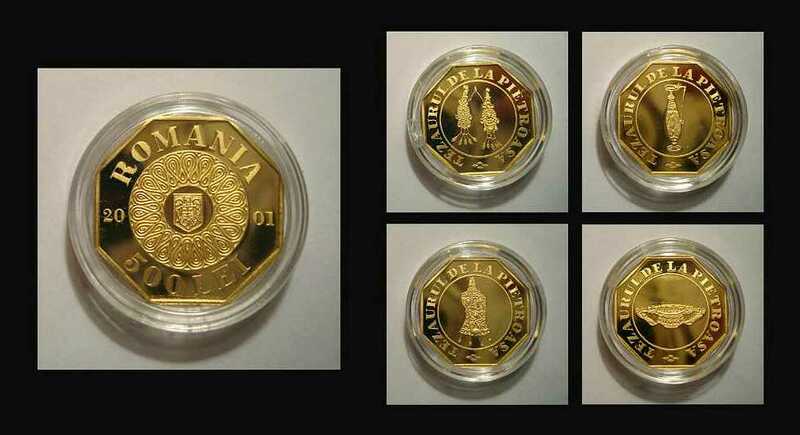 The History of gold series comprises four pieces of 500 lei from 2001 featuring the golden cache of Pietroasa, three 100 lei coins from 1999 (and from 2002 and 2003 too) with the Dacian helmet of Poiana-Coţofeneşti, from 2003 with an eagle from Apahida, from 2004 with the Cantacuzinian engolpion and several of 10 new lei from 2005 with the Perşinari hoard, from 2006 with the Cucuteni-Băiceni hoard, from 2007 with the rhyton of Poroina, from 2008 with the Hinova hoard, from 2010 with the Someşeni hoard, from 2011 with the buckle of Curtea de Argeş and with the cross from Dinogetia and from 2012 with the patera from Pietroasa Hoard.